When I stumbled upon Los Indios Bravos last year, I couldn’t help but proclaim that it was the best restaurant in Boracay island. It has everything I could hope for: a quiet location away from White Beach not flocked by too many tourists; a chill, casual ambiance perfect for long dinners and chats; a good selection of local craft beers; and impressive food. No wonder it’s a favorite of both locals and foreigners who try to stay away from the huge crowds. 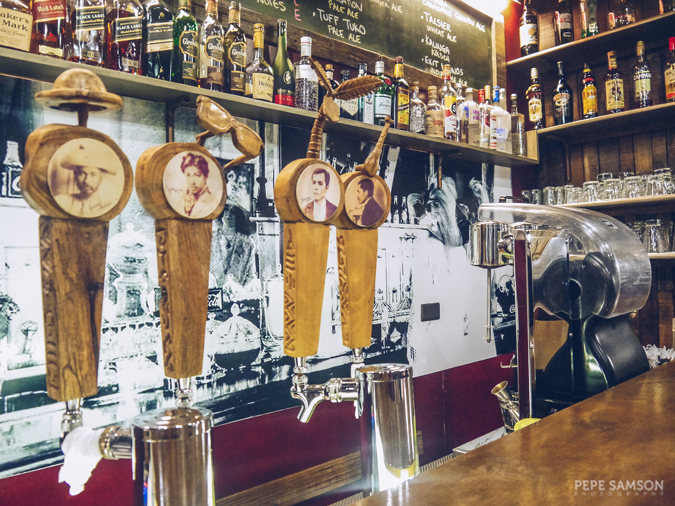 It totally changed the dining scene in Boracay, and introduced the gastropub concept among its inhabitants. 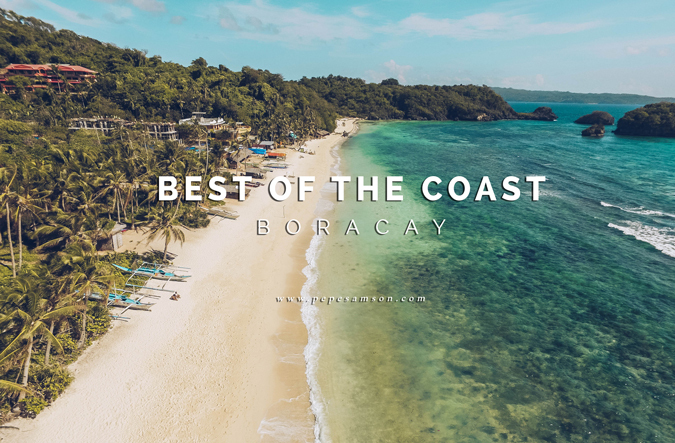 Last March, we trooped to their cozy little spot in Bulabog as part of the Best of the Coast Boracay—an especially-curated tour of the island’s best hotels, restaurants, bars, and scenic spots. 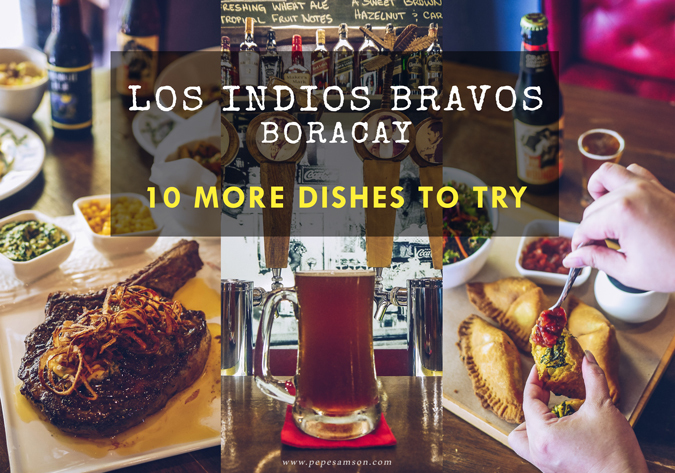 Of course, the island’s top restaurant has to be in this tour, and personally, I was happy that the other participating bloggers I invited to this tour loved Los Indios Bravos! If you have read my previous post about Indios, you would know that I am crazy for their Bitterballen, Oyster Rockefeller, and Chicken Tikka Masala—however, read on below to find out about 10 more dishes that I tried and loved on our recent visit. Diners in the Philippines normally get salads as appetizers to share—but rarely order one solely for themselves. 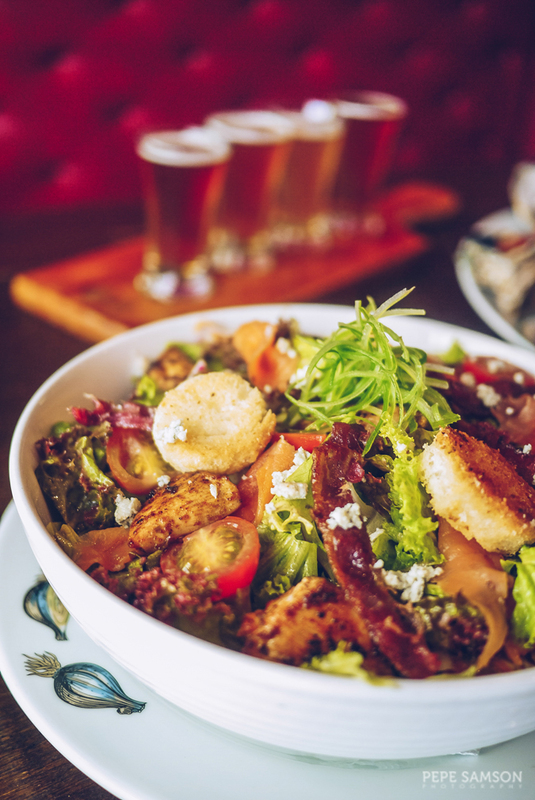 That can be changed with Los Indios Bravos’ delicious Cobb Salad, which comes loaded with bacon, smoked salmon, Cajun grilled chicken, tomatoes, and blue cheese, finished with apple cider vinaigrette. It’s refreshing and filling, with enough protein to fuel you up if you’re looking to have a salad for lunch. I would love to hoard this all to myself! A fan of Indian food? Try Los Indios’ Vegetable Samosa, an off-the-menu item that’s part of the restaurant’s daily specials. Soft dough envelops a delicious filling made of potatoes, peas, and spinach, as well as a variety of spices. 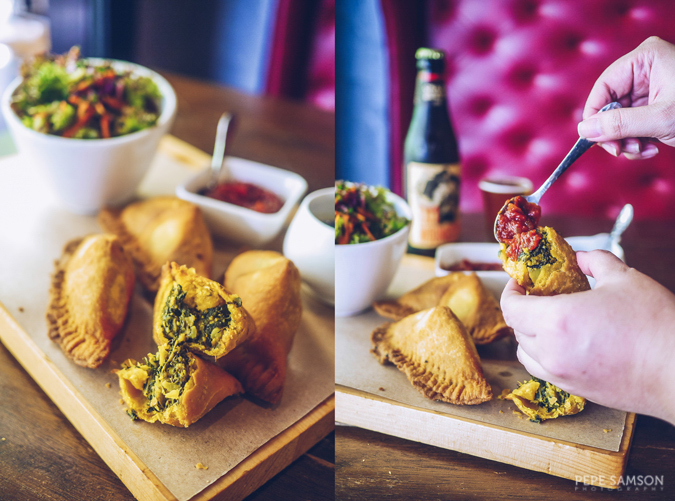 The samosas come with a side salad and two dipping sauces: tamarind chutney and tomato chutney. We couldn’t decide which is better so we dip on each one alternately. Yum! 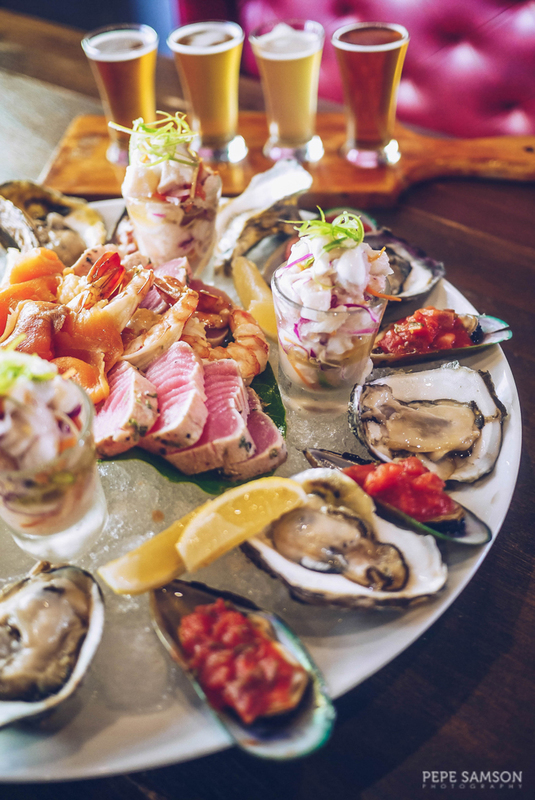 If you have tried—and loved—Los Indios Bravos’ amazing Oyster Rockefeller, you are bound to get obsessed with their Fruits de Mer: a cold seafood platter filled with poached prawns, smoked salmon, pan-seared tuna, baby octopus, fresh oysters, poached mussels, and kilawin (ceviche) shooters. This item simply wipes all other restaurants off the scene—Los Indios serves the best seafood platter in the island. Everything was luscious and incredibly fresh; the prawns are plump, the salmon and tuna exquisite, the oysters sweetish, and perfect with or without a drop of lemon. A must-order! 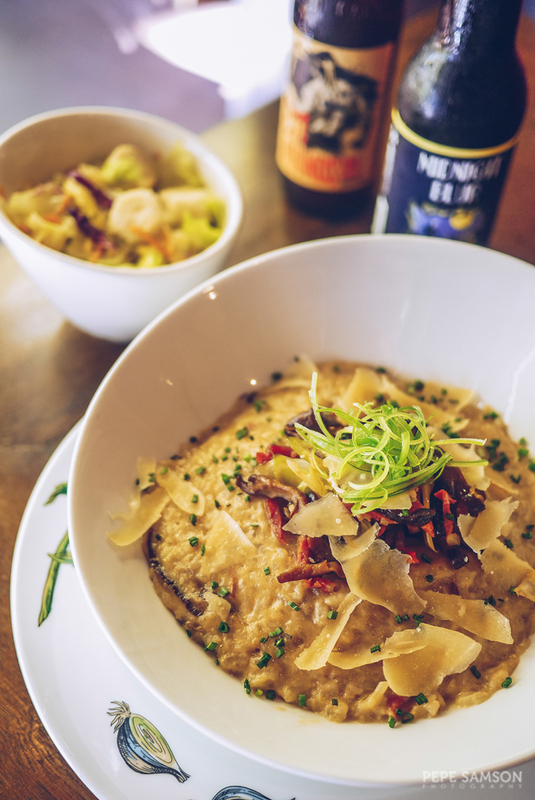 I love mushrooms—and risotto—therefore an order of mushroom risotto is always welcome. At Los Indios, the chef throws in some chorizo, leeks, and shiitake to spice up the Italian rice, then tops everything with freshly grated parmesan. I love how you can eat it all by itself, or pair it with the pub’s delicious meat dishes. This is definitely one of my favorites at Los Indios Bravos. Feeling like a true German? 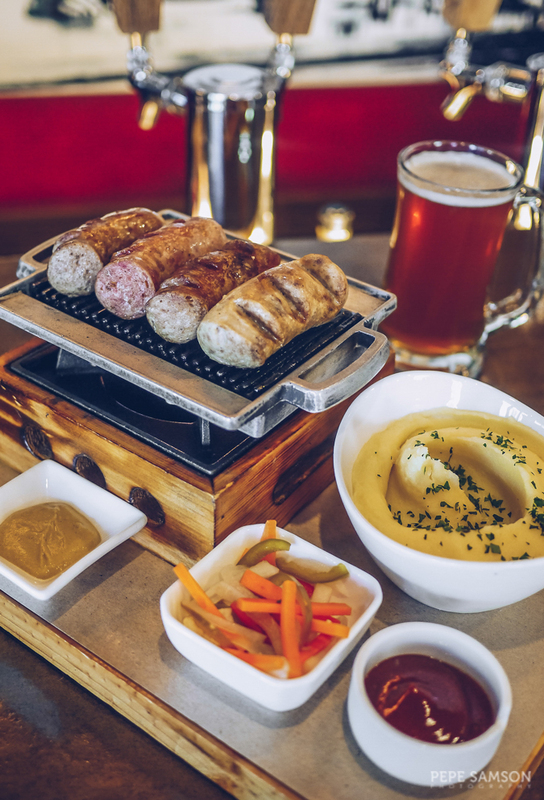 Order the Sausage and Mash to pair with your craft beers. With four types of sausages—Bratwurst, Cheese Bockwurst, Hungarian, and Kielbasa—this dish is sure to satiate your cravings for a good meaty partner for your booze. It comes with mashed potatoes, house pickles, Dijon mustard and my favorite—curry ketchup! A sure crowd pleaser. 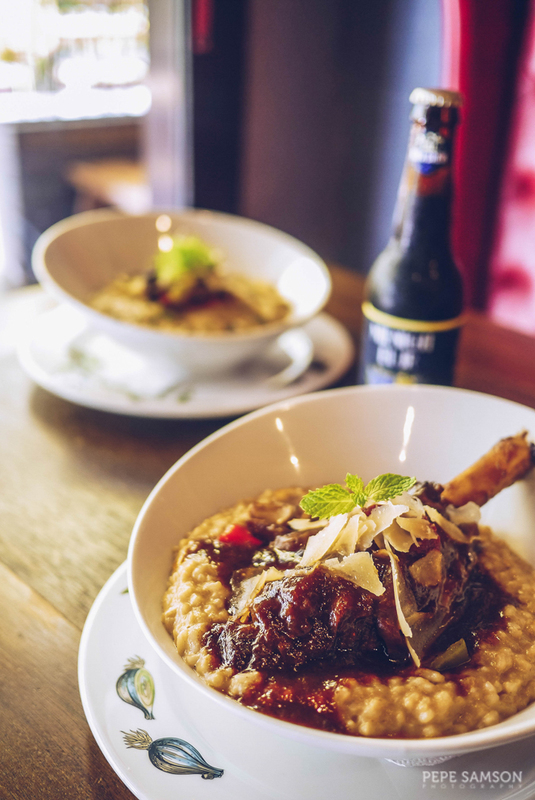 If you were to try only one dish at Los Indios, make it the Lamb Shank Risotto—a special item that’s only part of their daily specials, and not on their regular menu! It is, in one word, exquisite. The meat practically falls off the bone—incredibly tender, moist, flavorful, and devoid of that off-putting taste of lamb meat. Grated cheese on top keeps the flavors balanced. The risotto? Addicting. Ask for this dish when you visit Los Indios Bravos—this was everyone’s favorite! A close contender to the lamb shank, the Braised Australian Veal Cheeks is another must-try dish at Los Indios. 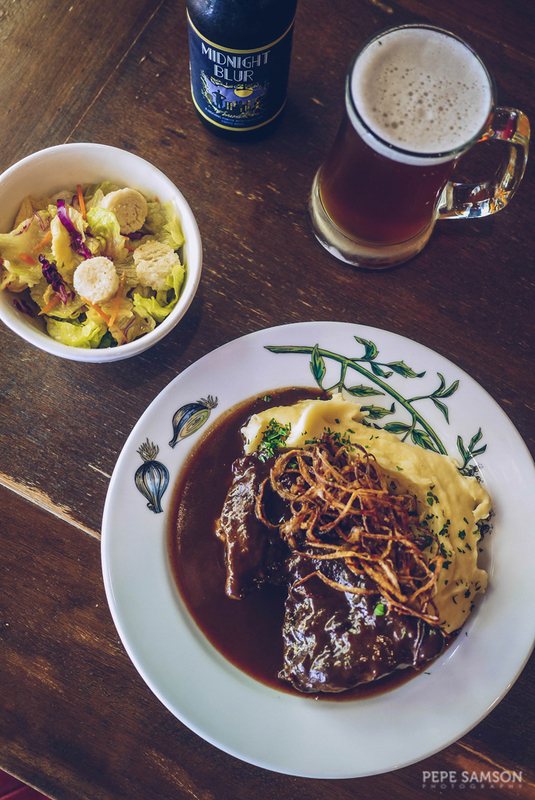 Served with red wine jus, topped with crispy onions, and accompanied by mashed potatoes and salad, these melt-in-the-mouth veal cheeks are so delicious. But don’t take our word for it—order it when you dine here. 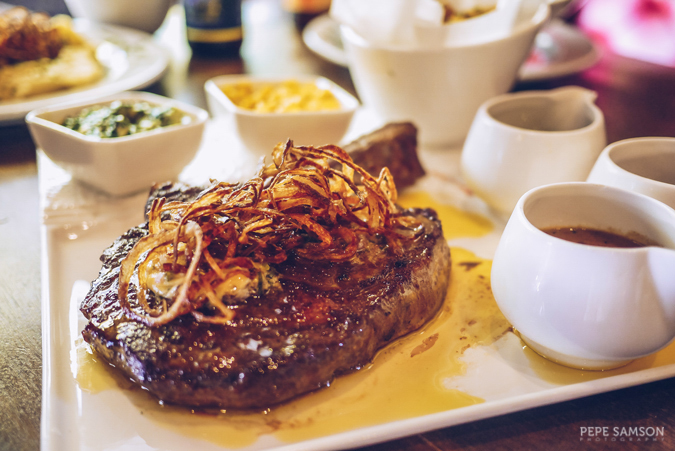 A carnivore’s dream, this dish is a humongous, thick slab of beef topped with compound butter and crispy onions. The meat itself is juicy, but the accompanying sauce—you can choose from steakhouse, peppercorn, or chimichurri—would further elevate its flavors. It comes with delicious creamed spinach and buttered corn, as well as a choice of mashed potatoes, steak fries, roasted potatoes, or steamed rice. I’m not sure if even those with the biggest appetites can finish this. It’s perfect as a dinner item, and if you’re ordering a few more other dishes, you will certainly have enough steak left over for pulutan. 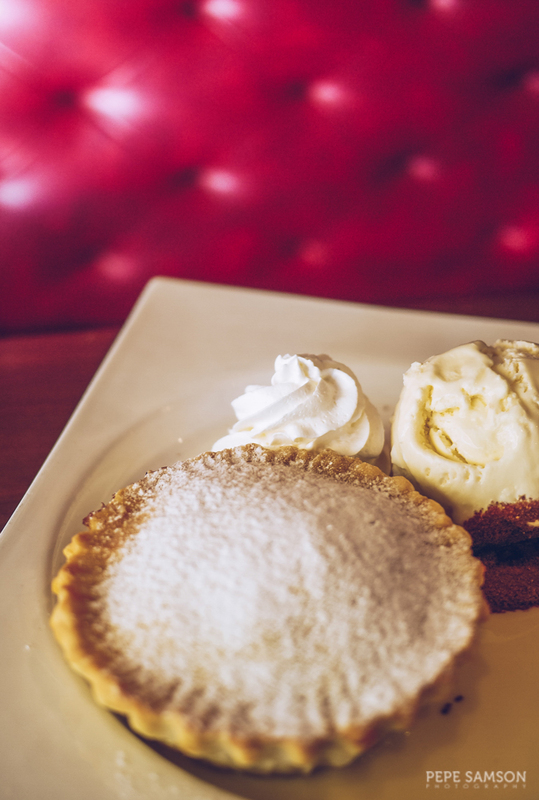 Wash off all those meats from your taste buds with Los Indios’ Apple Pie ala Mode—classic apple pie topped with vanilla ice cream and crème anglaise. I loved how this one wasn’t too sweet. As a lover of apple pie, I want to munch of those delicious apple chunks concealed inside a light crust without getting sick of too much sweetness. This one’s another interesting dessert. 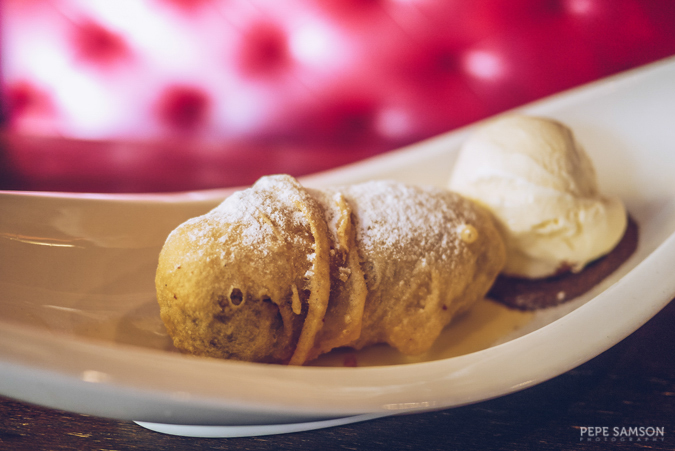 Mars chocolate is stuffed inside a light batter and then deep-fried—and the result is gooey, slightly crunchy bar better than the original. Topped with vanilla ice cream, crème anglaise, and chocolate soil, this comforting dessert is for the serious sweet lovers out there. What is your favorite restaurant in Boracay?